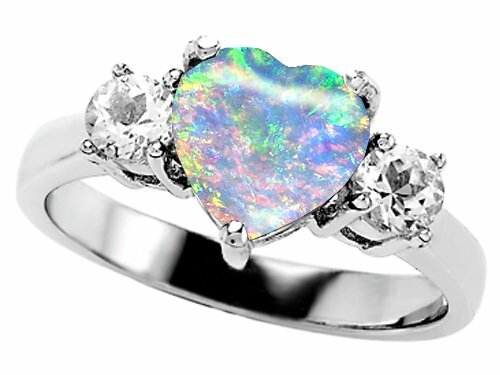 There are many superstitions surrounding the beautiful opal engagement ring. Some say an opal is bad luck if given to you by someone, but good luck if you buy it yourself. However, there are others who say just the opposite. There have been many negative beliefs (but also many positive ones) associated with opals throughout history. Rumor has it, that diamond brokers during the 18th and 19th century, were getting a bit nervous about the growing popularity of the beautiful opal. They feared this would cut into their diamond sales, and decided to further propel the stereotypes in order to dissuade customers from turning to the opal. The powers that be desperately tried to squash the superstitions when large opal deposits were found in Australia. Whether you buy into the superstitions or not, there is no denying that the rainbow hues of an opal engagement ring is sure to put a sparkle in anyone's eye. Opals are the noncrystalline form of silica minerals, formed from shapeless clumps of silica. This occurs when water in the ground containing dissolved silica seeps through dirt and sand, and the silica particles accumulate in cracks. Eventually the water evaporates, leaving the silica particles to cement together and an opal is born. The magnificent colors are created by the diffraction of light. When the formation is made of tiny silica spheres of similar shape and size, the reflected light is divided into a spectrum of colors, making the gem look as though it contained all the colors of the rainbow. With larger, less uniform spheres, the colors are more limited. Aside from the superstitions, an opal engagement ring also has a tough time in the market because it is not as durable as a diamond. On the Mohs hardness scale, an opal only comes in at about 5 or 6, whereas a diamond is rated a 10. Even sapphires and emeralds are tougher, with ratings of 7 – 9. 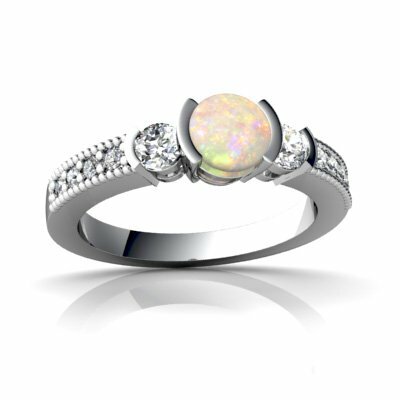 This means your opal must be treated with extra care, as it could break, or wear down over time. But, that doesn't mean they aren't valuable. Opals have been found in wide array of colors. They can be pink, white, blue, green, gray, or black. The Australian boulder opals are the most robust in color and also the most durable, which means they are also quite pricey. The most expensive and rare opals are the black variety. These are distinguished by their dark backdrop containing rainbow colors or deep blueish-green hues. Fire opals, which may have a backdrop of any color, exhibit an extraordinary amount of red highlights and are also quite rare. According to legend, Ancient Greeks believed opals were created when Zeus wept tears of joy over the defeat of the Titans. Anyone finding one of these rare gems would be blessed with the ability to see into the future. The Romans believed that when you wore opals your thoughts were more lucid and your actions more spontaneous. Today, many people believe black opals will bring you good luck, and protect you while traveling. Others are convinced they help increase energy levels, enhance mental focus and motivation. When wearing a black opal, people are said to feel more self-confident and more connected to their core self. Black opals are even believed to have a positive impact on physical issues such as lessening the pain of childbirth and curing erectile dysfunction. Fire opals are believed to have healing powers because of their intense warm orangey red coloration. People wearing these report relief from depression and blood disorders. 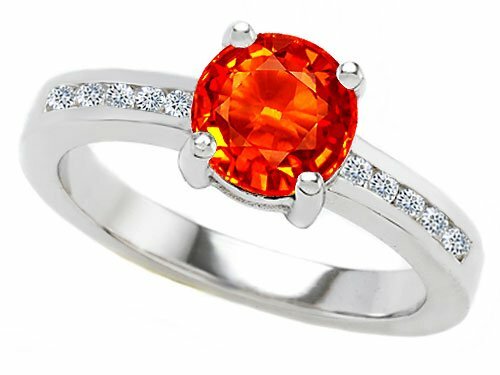 The fiery gems are also worn to help with circulation problems. White or milky colored opals are praised for their calming effects on a person. 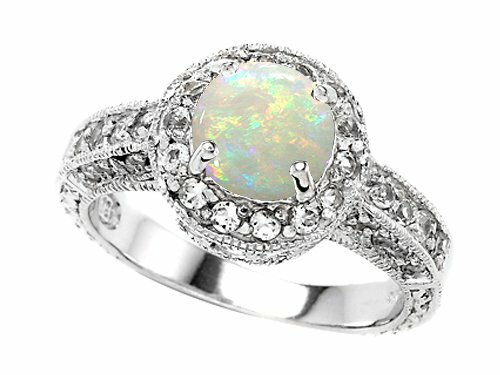 This type of opal engagement ring can help bring balance into a person's life and assist in lessening symptoms of nervous disorders. Opals of other colors are also associated with superstitions. Blue opals are believed to be the pathway to your “third eye.” Greener ones provide you with extra energy. Pink opals help with emotional issues and romantic problems. Because of all of these beliefs, opals are the gemstones of choice for crystal healers. 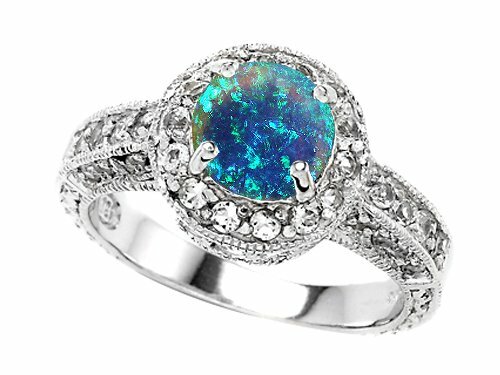 You don't have to believe in the magical or mystical powers of the opal to appreciate its beauty. 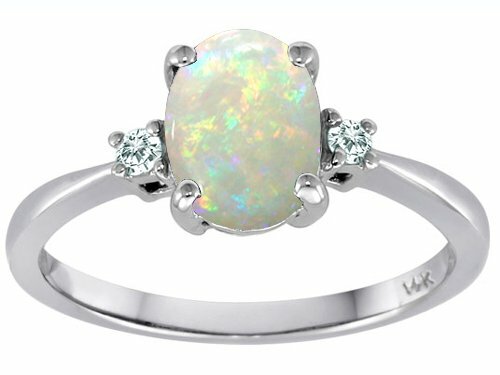 And since opal is the birthstone for October, an opal engagement ring given to a girl born in October is the ideal choice.